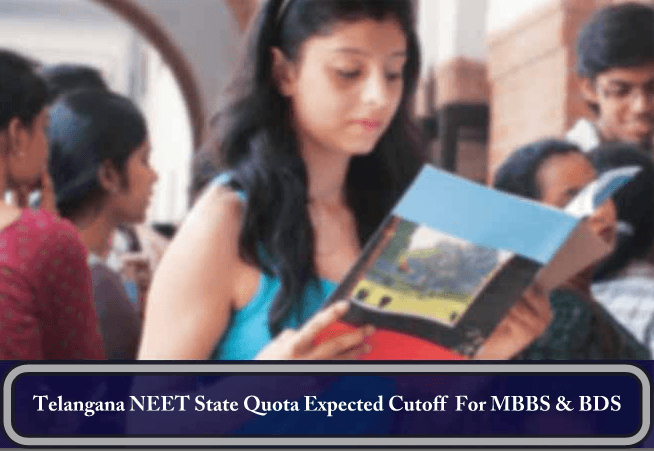 Telangana NEET State Quota Expected Cutoff 2018: Jawaharlal Nehru Technological University, Hyderabad is the official authority to conduct state quota NEET Counselling for MBBS and BDS courses in Telangana state. Recently, Central Board of Secondary Education had successfully conducted NEET UG entrance examination 2018 at various examination centers across the country. Total 13, 26, 725 were registered for NEET 2018 and around 13.19 lakh candidates appeared on 6th May examination. The examination was conducted to fill all MBBS & BDS seats in all medical and dental colleges. Now as the CBSE has conducted the NEET examination 2018, they are busy in checking the OMR answer sheets. As per the schedule, NEET Result 2018 will be announced on 5th June 2018. 1.1 Kaloji Narayana Rao University of Health Science will announce Telangana NEET State Rank List on their official website. All appeared candidates can download the rank list after 10th June 2018. As per the Supreme Court order, NEET is the only medical examination across the country. No states are allowed to take their own state level medical entrance examination. After the announcement of NEET 2018 Result, all states will start their state quota NEET counselling. Central Board of Secondary Education has announced the NEET UG Result 2017 on 23rd June 2017 on their official website. Kaloji Narayana Rao University of Health Science will announce Telangana NEET State Rank List on their official website. All appeared candidates can download the rank list after 10th June 2018. Appeared candidates will be able to take admission in MBBS & BDS courses across the country on the basis of NEET scorecard as the government has made central level counseling mandatory for all states except Telangana, J & K, and Andhra Pradesh. These states have special ordinances for MBBS/BDS Admission 2018. Here we are providing our expected Telangana NEET Cut off Marks which is based on the previous year’s NEET results. Candidates who are scoring marks more than below mentioned marks in their category will be able to participate in Telangana NEET State Quota Counselling 2018. According to the rule, these 3 states TN, Andhra Pradesh, and J & K will have the 100% seat reservation. Means, all MBBS & BDS seats in these states are fully reserved for those candidates who have domicile of these states. Other state’s candidates will not be allowed to get admission in these states. Admission in MBBS & BDS courses in Telangana state will be based on the merit list. Jawaharlal Nehru Technological University will publish the state merit list of successful candidates. Merit list will be generated on the basis of marks obtained in NEET-UG entrance examination 2018 scorecard. Eligible candidates will be called for the counselling registration and college’s choice locking for MBBS & BDS seats. All Government, private, deemed, and central colleges will be under this counselling. All seats of MBBS/BDS in Telangana state will be filled through this state-level counselling. Apollo Institute of Medical Sciences and Research, Hyderabad NTR University of Health Sciences, Vijay Wada Trust 2012 100 Permitted for renewal of permission for 2015-16. Dr. VRK Women’s Medical College, Aziznagar NTR University of Health Sciences, Vijay Wada Trust 2010 0 Not Permitted for renewal of permission u/s 10(A) for 2014-15. Gandhi Medical College, Secunderabad NTR University of Health Sciences, Vijayawada Govt. 1954 200 Recognized for 150 seats. Permitted for renewal of permission for increase of seats from 150 to 200 u/s 10(A) for 2015-16. Government Medical College, Nizamabad NTR University of Health Sciences, Vijayawada Govt. 2013 100 Permitted for renewal of permission u/s 10(A) for 2015-16. Kakatiya Medical College, Wrangal NTR University of Health Sciences, VijayWada Govt. 1959 200 Recognized for 150 seats. Permitted for renewal of permission for increase of seats from 150 to 200 u/s 10(A)for 2015-16. Kamineni Academy of Medical Sciences & Research Center, Hyderabad NTR University of Health Sciences, Vijayawada Private 2013 150 Permitted for renewal of permission u/s 10(A) for 2015-16. Kamineni Institute of Medical Sciences, Narketpally NTR University of Health Sciences, Vijayawada Trust 1999 200 Recognized for 150 seats. Permitted for increase of seats from 150-200 u/s 10(A) for 2015-16. Malla Reddy Institute of Medical Sciences, Hyderabad NTR University of Health Sciences, Vijayawada Society 2012 0 Not permitted for renewal of permission u/s 10(A) for 2015-16. Mallareddy Medical College for Women’s, Hyderabad NTR University of Health Sciences, Vijayawada Society 2013 0 Not permitted for renewal of permission u/s 10(A) for 2015-16. Mediciti Institute Of Medical Sciences, Ghanpur NTR University of Health Sciences, Vijayawada Trust 2001 100 Recognized for 100 seats. Not permitted for renewal of permission for increase of seats from 100 to 150 u/s 10(A) for 2015-16. Osmania Medical College, Hyderabad NTR University of Health Sciences, Vijayawada Govt. 1946 250 Recognized for 200 seats. Permitted for renewal of permission for increase of seats from 200 to 250 u/s 10(A) for 2015-16. Prathima Institute Of Medical Sciences, Karimnagar NTR University of Health Sciences, Vijayawada Trust 2001 200 Recognized for 150 seats. Permitted for increase of seats from 150-200 u/s 10(A) for 2015-16. Rajiv Gandhi Institute of Medical Sciences, Adilabad NTR University of Health Sciences, Vijayawada Govt. 2008 100 Recognized on or after February, 2013. S V S Medical College, Mehboobnagar NTR University of Health Sciences, Vijayawada Trust 1999 150 Recognized for 100 seats. Permitted for renewal of permission for increase of seats from 100 to 150 u/s 10(A) for 2015-16.
is it possible for general category student with marks 520 to get a seat in any government or private college in Telangana? It’s hard to say. Please wait for the official cut off. Yea… Ok.. but what would be safe zone… 540+? i got 490 marks , can i get set in general quata.. I got 370 marks.. will I get mbbs seat in any private medical college in b category…. I have got 370marks in neet 2017. Does I have any chance to get mbbs seat in any of private college under b category..?? 320 marks in neet.any choice of getting a mbbs seat in telangana? i got 344 marks in neet 2017 and i belong to telangana domicile . what can be my state rank?? Actually I have secured 526 marks in neet and my question is the dates of all India quota counselling and Maharashtra state counseling are clashing. So how to deal with that?? Respected sir, My rank is 48,000.and I’m ST. From Telangana state.may I expect mbbs seat??? Hi I got 385 and also hold NCC B certificate. What are the chances of getting a seat. Is NCC quota considered for NEET in Telangana ?? hi …sir….iam prem kumar..i wil compleed intermediate 2014..my age 20 yrs….sc candiate…..once i will write neet exam 2017….iam eligible or not next neet exam 2018. this gap any problem???? I got All India Rank 4799 belong to Telangana State General category. Can i get seat in Andhra Medical College, Visakhapatnam under non-local quota. Please inform. when do the state ranks will be released. I GOT 301 MARKS IN NEET in 2017. My caste is OBC.Am I qualified accoding to TS state cut off? I GOT 301 MARKS .AM I QUALIFIED ACCORDING TO STATE[TS] CUT OFF? it is difficult to get seat govt in other states .100 percent you are going to get in telengana good college only.5799 for first round air 8317 second round air. I secured 302 marks in NEET 2018. I belong to sc category.can I get seat in A category. A. Shireesha got neet marks 286.she at category aiq rank201597 She got mbbs seat? Sir,I got 451 marks in NEET 2018 , Telangana state rank is 1807 , can i get a seat in telangana in A category in govt/private colleges( in A category only )??? ?